There has been something I started to notice since i+e 2015 that has had me rethinking the value of social media and music shows. As good as they are, I think they sometimes distract us from the moment. As a result, we end up missing something. Let me start by mentioning that I like social media. Maybe not as much as some of my friends, but I do enjoy it. Hell, I’ve got a blog and I use Facebook, Twitter and Instagram to help expand my reach. By the way, if you would ask most friends, I would be one of the last people they think would have blog. But I digress, without social media, I would have a much harder time getting the word out. So, it is a very useful tool. But something happened on the road to the future. I first noticed it with my friends who embraced social media much earlier than I did. They spent a good amount of time on it and I sometimes found it impolite on occasions like dinner or at the movies. What would last for several seconds began to stretch to minutes as everyone checked their phones and cycled through their apps. Since I was one of the last ones to embrace these technologies, I was first to poo-poo them. I saw it as a waste of time. It wasn’t until years that I finally was seduced to the dark side (I’m kidding). I’m not a Luddite. I like technology. What I didn’t think would happen was how much it would change my experiences at a U2 show and not all for the better. Sure, it is wonderful to be able to shoot, record and even share the content with others. But, when did it become more important to do that than to simply sit (or stand) back and just enjoy the show? It’s happened to my friends, too. We all do it now. I can say that I’m shooting as much as I can so I can have content for my blog—and that is true—but I’m also doing because it seems like the best way to get people to notice my site. My buddy who is far more proficient at social media than me has thousands of Twitter, Instagram and Periscope followers. When he posts something on any of the channels, many take notice. I want that for my blog, but have yet to figure that one out. What started out as an interest (my blog) has grown into something else. I enjoy writing about my favorite band and it’s awesome when someone responds to my work, which is why I will continue do it. The challenge comes from finding that middle road where I am not letting it overtake my actual enjoyment of the show. What I noticed during Joshua Tree 2017 was how many people were recording, live-streaming or Periscoping the show. It was astonishing. I learned about Periscope about a year ago and didn’t think much of it. My buddy uses it and I see the appeal. The ability to interact with so many people is kind of cool. 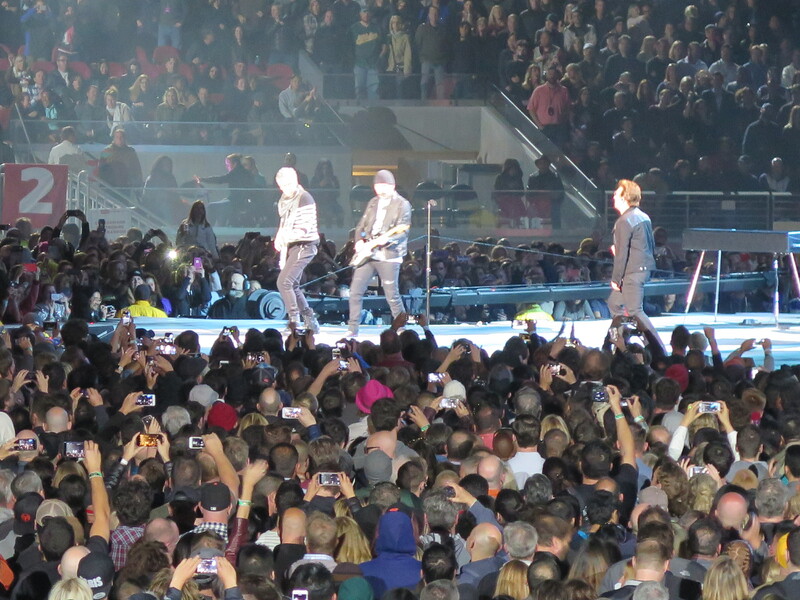 So, ‘scoping (as I have learned) a U2 show can be cool. I say can because it lets people who were not able to go the show, still see it. It’s a good way to share your experience with fellow fans and that always feels good. But, you can become so fixated on ‘scoping the next song or what’s going around you that you miss the whole song yourself. What was supposed to be a shared experience is reduced because you are trying get the best shot instead of simply enjoying the band with your friends. The strangest thing about it was how it seemed to affect the band, primarily Bono. Our beloved front man has always been the best at engaging the crowd. I first noticed it during ZOO TV way back in 1992. He had such a connection to the fans because he made one. During The Elevation Tour 2001, when they were “reapplying for the job”, I felt such a bond with them. There was something very special about that tour and I was lucky enough to be in the heart. I got a high-five from Bono and that was awesome. With each tour, I felt like they were getting better at connecting with us. A part of that is due to stage design, but most of it is because of them, particularly the B-Man. This time around it felt like something was missing, or maybe withdrawn. That’s the best way I can describe it. It appeared that performing to a field of raised smartphones was affecting the way he was interacting with the crowd. It looked like he was competing with their devices for their attention. It was weird. He’s a pro, so he didn’t stop trying. The show got better when the band returned to the main stage. 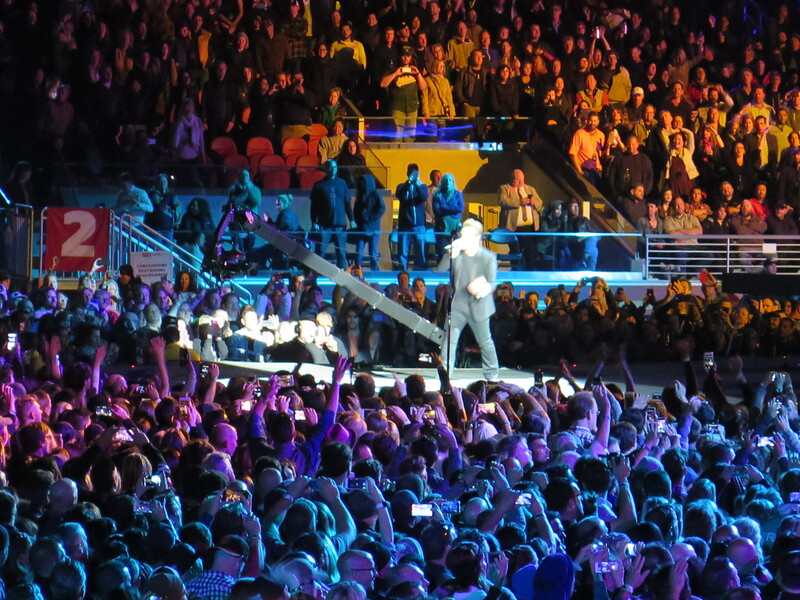 Bono seemed more comfortable even though the smartphones were still in the air, he was farther away. I can’t be sure if that was the reason, but it’s the only one I have. I also realize that this may be the way it will be from now on. The days of going to a show and just seeing it might be over. If I sound like and old guy lamenting about days long past, I might be. Technology is awesome and I wouldn’t want to do without it, but it also has its drawbacks. Our boys are the best in the business and I’m sure they’ll figure this one out. From what I’ve read since seeing the show, they are. This entry was posted in Uncategorized and tagged #JoshuaTreeTour2017, #LevisStadium, #U2JoshuaTree, #U2TheJoshuaTree2017, u2 by achtungninja. Bookmark the permalink.